Euripides’s Bacchae is the poet’s late masterpiece, his drama of repression vengeance and illusion, first performed for the king of Macedon in 406BC, forbear of Alexander the Great, a profound admirer of the play. It puts women centre stage and is the classic exploration of female rebellion and withdrawal, altered consciousness and repressed male sexuality, expressed in terms of transgendered identity and, through its chorus of maenads, the perils of chilling out and living the deluded life of a groupie. Yana Zarifi- Sistovari and M.J. Coldiron the directors, have devised a superb multi-cultural production, using elements of dance and music which range from modern Brazil to Sardinia composed by Dr Manuel Jimenez yet remain spellbindingly in touch with the spirit of Euripides’s play and its pre-Christian Greek context which they understand so well from a lifetime of study and dramatic experience. Their all-professional cast includes stars from Australia (Scott Middleton as Dionysos), Paris Texas (Shelby Lynn Gilliam as Agave), Sardinia (Salvatore Scarpa as Pentheus), black South Africa and eastern European(Chorus), performing in accessible English, based on the translation of Britain’s leading Bacchic scholar, Richard Seaford. The result is electrifying, one of the great theatrical experiences its recent audiences can testify. In July 2017, we, Thiasos company, presented the play (produced by Yana Zarifi-Sistovari and Robin Lane Fox) in the outdoor setting of New College, Oxford’s gardens. The play was prefaced by a brilliant performance by Roberto Tangianu, master of the Sardinian triple-pipes, the launeddas, the instrument which experts now believe to be closest to the aulos-pipe of ancient Greece. 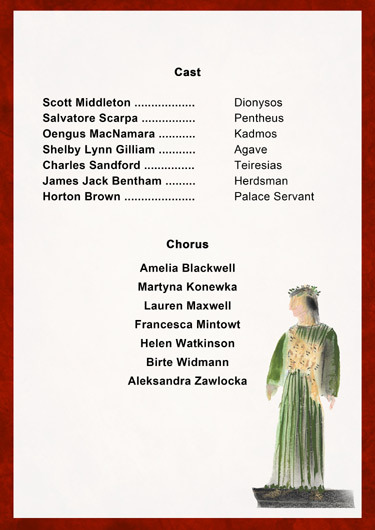 From the maenad chorus’s first entry, followed spectacularly by Dionysos (Scott Middleton), to queen Agave’s final heart-rending lament we were swept along by the drama, which unfolded with a pace and emotional force which no other production in modern times has captured. ‘Uniformly superb cast… A triumph. I hugely enjoyed it,as I have no other performance hitherto. Music and chorus and dance moves were stunning.’ (Professor Armand D’Angour, expert in Greek drama and music, Oxford University). First performed last summer in 2017 in the glorious grounds of New College, Oxford, Thiasos Theatre Company’s vibrant and deeply ritualized production of Euripides’ Bacchae has just received an exciting revival in the very differently spectacular setting of Gardzienice, the home just outside Lublin of Poland’s leading theatre company. New College Gardens afforded a backdrop of a vast ten-metre high tree-planted mound, which doubled as Mount Cithaeron to where the women of Thebes have fled before the start of the play in order to worship the newly arrived god, Dionysus. And it was from the top of this mound, in front of a long flight of stone steps, that the victorious and vindictive god chillingly appeared at dusk at the end of last year’s production. Dionysus, aloft, not only overwhelmed those dazed and defeated mortals from the house of Thebes left in tatters beneath; he also exercised his spellbinding powers over the spectators seated in deckchairs on the College lawn below. In Gardzienice, the audience was more conventionally seated inside in the raked seating in the relatively small but hugely flexible studio space of what is rather deceptively known as the ‘Shed’. The Shed, one of a number of available performance spaces at Gardzienice, has the potential to open out onto wild gardens; and for the Bacchae, the chorus of Asian maenads surged forward from this verdant space in the distance in the opening scene of the play (in Oxford they entered less forcefully from behind the deckchairs) before thronging the performance area proper to begin their frenzied celebration of Dionysus. Although the Company no longer had any mound from which the deus ex machina might appear, they found a creative and effective alternative: Dionysus loomed out of the now darkened wild space beyond on stilts – towering above the cowering mortals beneath. And this year, Scott Middleton as Dionysus, who now seems to have grown even more confident in the role, adroitly brought allure and menace in equal measure to these final moments. Thiasos Company’s performances are prized for their unique blend of music and dance and their Bacchae is marked by two stand-out performances. The first is the stunning intercultural music, under the direction of Manuel Jimenez, that draws on an eclectic mix of Brazilian Candomblé, Eastern European folk traditions and Sardinian cantu a tenore. At its centre is the haunting sound of the launeddas, the Sardinian triple pipes, widely understood to capture the eerie strains of the ancient aulos, which are spectacularly played here by the Sardinian musician Roberto Tangianu. 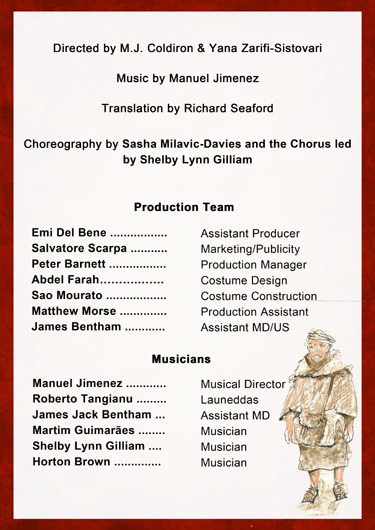 The other stellar feature of this show, as in New College in 2017, is the lament sung by Shelby Lynn Gilliam in the part of Agave. Gilliam’s Agave, finding a rawness in the lower register that can only come from plumbing the depths of pain to the point of agony, left barely a dry in the house as she struggled to piece together the body parts of the son she had unwittingly hunted down. Our Bacchanals will be performed by 18 actors of our celebrated Thiasos company, co-directed by Margaret Coldiron and Yana Sistovari. 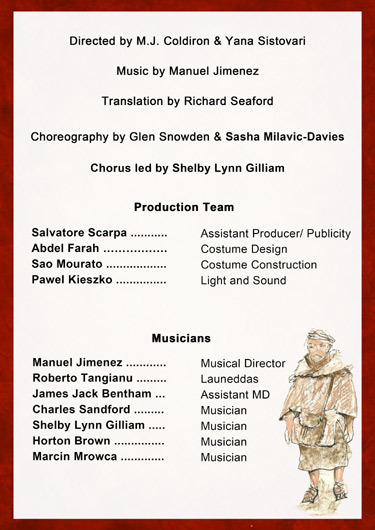 We use an English translation by Bacchic expert Richard Seaford and have already received a standing ovation in Teatr Polski of Warsaw and in the ancient Greek theatres on Cyprus. Unlike Euripides’s cast, ours includes women. They wear masks, but only on the backs of their heads, like those worn in the Dionysiac festival, which is still held in February on the Greek island of Skyros. Music and dancing are integral to Greek tragedy, and Thiasos are flying in from Sardinia the world-famous Roberto Tangianu, player of the triple pipes. They give the sound closest to an ancient “aulos”.